Walk into any bookstore, and there’s a good chance you’ll find a book on painting technique by Charles Reid. His considered yet informal method of instruction has guided both the aspiring professional and the hesitant amateur, making him one of today’s most influential American artists. In workshops, his personable approach to painting inspires students to work beyond their perceived limitations, introducing them to the joy of the creative process. Perhaps his own early difficulties as a student make him an insightful teacher. By his own admission, he was a “late bloomer.” With a chuckle, he says that his nicknames back then were “Tabula Rasa” and “Foggy Charlie.” Growing up in Connecticut and upstate New York, Reid was encouraged by his father to pursue art. After private school improved his grades, he attended the University of Vermont. After two years, he transferred to The Art Students League in New York City. This historic institution is one of this country’s oldest art schools, and many of the most celebrated names in American art have passed through its doors. Yet Reid admits that during his attendance in the late fifties/early sixties he was considered one of the least promising students. Following a stint in the Army reserve, he finished his studies and married his college sweetheart Judith. She has served as his favorite model over the years, and his books detail her value as his unofficial assistant. The couple began their marriage with a six-month stay in Madeira, granted by an aunt’s bequest; and here Reid had his first show along with other young Americans on the island. Through a friend he was given the opportunity to write a book on figure painting for Watson-Guptill, which was published just as the Famous Artist School folded. Briefly, his school teacher wife supported the family, now including two small children, but soon he launched his successful freelance teaching career. Reid takes his subjects from his own surroundings. Even his forays into illustration have the feel that this is something he’s seen over his fence. Working with the “handy stuff” means that the emphasis is on the art-making itself rather than the subject. At some point the life-like representation of an apple or a dahlia becomes a mix of reds, pinks, and greens as pure paint. The very ordinariness of the objects propels their metamorphosis into the marvelous. Watercolor is ideally suited to lay bare the process of transformation. With the measured use of paints on treated paper, the artist can create an illusion, while revealing the very materials of his magic. This aqueous medium records the history of the artist’s gesture, and Reid’s a la prima approach especially pulls in the viewer. He admits that it’s the process that he gets “a kick out of” rather than the finished product. Using a direct approach, Reid shuns the practice of glazing and finds the “technically correct” uninteresting. He sees a danger in the facile use of watercolor, and his own work incorporates unintentional spots and splatters. While many artists build their images from light to dark, he starts with the mid to dark values. Emphasis is on spontaneity and swiftness to avoid reworking one’s vision into a “confused muddle of stuff.” Working for three-hour periods keeps the process fresh. Reid painted the work on the cover, Ariel Sands, Bermuda, during one of his workshops. 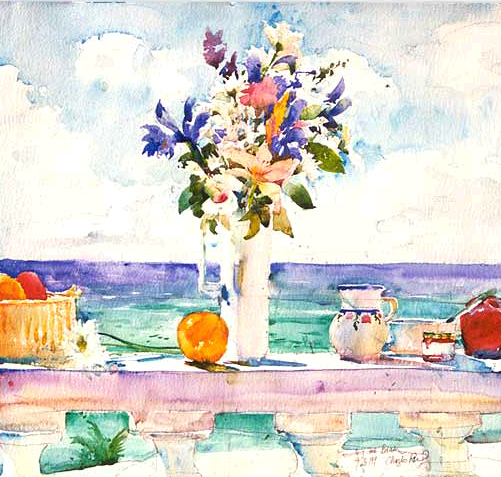 An arrangement of flowers, fruit, and crockery are lined up on a balustrade, their precariousness suggesting the artifice of their placement. The foreshortened paintbrush at the right is another indication that this is a grouping of objects for an artist’s work. All the visual clues create a sense of depth and weight. Yet the objects seem to hover, as the balustrade appears to offer no support. The horizontal display is anchored by the swath of green and blue representing the ocean. Even the white shapes of the vase, pitcher, and bowl are defined through contrast with the background. Deft in the economy of his contour drawing, Reid energizes his inanimate objects. Reid places the horizon line so that the concentration of color strokes, which portray the flowers, is set off by the white-blue sky. The vase and flowers constitute a vertical motion, which leads the eye upward, and the burst of flowers appears like a sunlit fireworks display. We get pleasure from the experience of oppositions resolved. The still life objects serve as light-gatherers. Boldly using the white surface of the paper, Reid has modulated his composition through a balance of warm (red, yellow) and cool (green, blue) colors. The magenta, an effect of the reflected light of green grass, is the complementary color of the green sea, creating a gentle tension; and inbetween, the objects hang in the air. Reid says that his art is about “the perception of light,” and his homes in Green Farm, Connecticut, and Novia Scotia sustain his study of water and light effects. The artist achieves a clarity in Ariel Sands, Bermuda that is exhilarating. We want to be sitting on that terrace, and the way in which our eye must complete the painting allows us to participate in this celebration of living. The architectural forms and domestic objects create a cozy boundary to the freedom and escape of the open sea. One of the titles of Reid’s books is Painting What You Want to See — his invitation to extend our sight beyond the familiar.